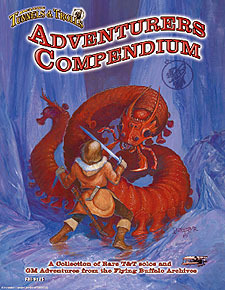 Herein are solitaire and GM adventures for use with the Tunnels & Trolls system. You will need the Deluxe Tunnels & Trolls rules to play. This 88 page collection of rare mini-solos and GM Adventures from the Tunnels & Trolls archives, will take you on swashbuckling, mystical mayhem through the streets of Khazan, the seaside docks of Gull and the frozen realm of the Circle of Ice. Then descend into the hidden depths of Trollworld in search of gold and glory. Plus a look back at Sorcerer's Apprentice, some Troll Teasers and a new GM Treasure Generator by Ken St Andre.